To understand why we even have a Silver Line, you need to know the history behind it. When they first built the Orange Line in 1901, it was elevated over Washington Street (the EL, as it was called). For 86 years, it provided speedy transportation over the busy thoroughfare. However, it was quite dingy at street level with a huge structure right overhead. Also, the EL was showing its age, so this prompted the MBTA to tear it down. They relocated the Orange Line to the Southwest corridor, originally to be a highway. Though the Southwest Corridor was mostly only a few blocks west of Washington Street, replacement service was needed. The MBTA compensated with the 49 bus, which in theory provided frequent service along Washington Street. However, the 49 was slow going, getting caught in traffic and stopping at every other street. The 49 was scrapped, and in 2002, the Silver Line entered service. This should make the Silver Line the ideal replacement, right? Wrong. My father and I were on a transit extravaganza of sorts. Arriving at Dudley on the 1, we were originally just going to take the same bus back to the Green Line, where we had to go. But upon arriving, we saw the SL5 heading for Downtown Crossing. We decided we'd take that and get off at Boylston. Getting on, we immediately noticed how nice the bus was. 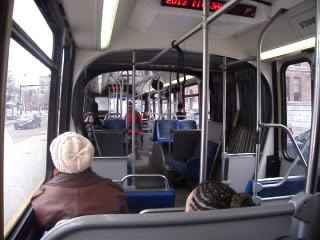 It was a long articulated bus with cushioned seats, and it just felt sort of new. The Silver Line also has some really nice stops. They're large shelters with silver signs (indicating the Silver Line) and even "next bus" countdown clocks. The bus travels reasonably fast... for a stretch. When the bus gets to Chinatown is when you notice some flaws. The streets turn narrow, the bus lane is gone, and you're forced to contend with city traffic. Our bus was barely moving, and it took forever to get to Downtown Crossing. Also, the nice stops from Washington Street are gone; as far as I could see, there aren't even shelters once you get downtown. Finally, the bus turned off Washington Street and went onto Temple Place, a much smaller side street. This is where everybody got off, but since I know that the SL5 goes to Boylston heading back to Dudley, my father and I stayed on while the bus driver helped a man in a wheelchair off the bus. As the driver started to move the bus, though, there was a loud noise. Noticing us, the driver said, "Out of service!" Getting off, we saw that the wheelchair ramp had hit a pole or something and was really busted up. Guess we had to walk to the Green Line. Ridership: The people who used to take the Orange Line EL; locals. It surprised me, though, that there were only about 10 people on such a long bus. However, the buses going the other way seemed crowded. Pros: The buses and stations are nice, and the bus travels pretty quickly for a lot of the route. Plus, Washington Street looks a lot nicer without a huge EL over it. Cons: Is this a good replacement for the Orange Line? No. At least not downtown. Being stuck in traffic is not the same as soaring over the street. Also, I'm wondering why the MBTA didn't bring it all the way down to Forest Hills. Nearby and Noteworthy: Downtown Crossing has a nice pedestrian walkway with stores including a Macy's and a GameStop. Also, the SL5 (and its South Station cousin, the SL4) serves the theater district, where I like to go with my theater-obsessed parents. Latest MBTA News: The MBTA put up signs around the system talking about Red Line shuttle buses this weekend between Harvard and Alewife... however, it doesn't say this on the MBTA website. Expect anything on your commute.